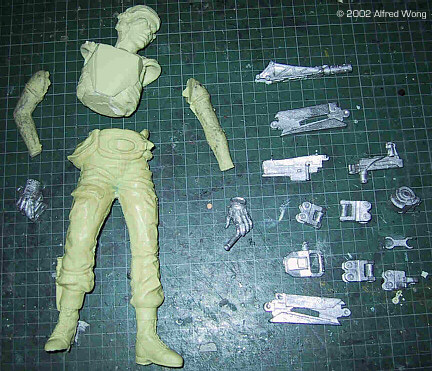 Kit preview of 5th Sense's Vasquez from "Aliens" w. Smartgun. For Christmas, my wife got me the new 1/6 scale kit of Vasquez from Monsters in Motion. The kit's manufacturer is an Irish company called "5th Sense", which I reckon refers to the sense of SMELL, because the first thing you'll notice is the strong smell of kerosene emanating from the yellow resin parts. Cutting or sanding the resin will release an even stronger dose of the pungent odor! I actually got a bit nauseous from it, and even after thorough hand washing the smell still lingered on my hands! 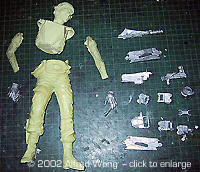 Four resin parts make up the figure, consisting of a torso w. head, the legs, and the two arms. The hands are in white metal, cast integrally with the gun grips. Fourteen metal parts make up the smartgun, which in the movie was an ingenious coupling of a Spandau MG-42 with a steadicam mount. It was a fully functional prop. The instructions are very poor; the figure may be a no-brainer, but the gun is fairly complex. How it goes together is not at all obvious, and the instructions are of little help in this. There's good detail and looks accurate, Vasquez's face is a reasonable likeness. Although, I may take down her chin a bit…it looks a bit big. The one noticeable problem is that her left leg is a good ¼" longer than her right leg, even allowing for the slight bend of the right leg. 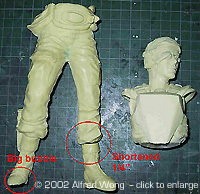 In pic#2 you'll see that I did shorten the left leg by a good ¼". I cut the leg at the boot line and removed the ¼" from the pant leg. When I did this the kerosene smell was almost overwhelming! As I am typing this article I can smell the model on my desk, and it's not all that pleasant. The resin is very hard, btw, and has a hard, clear core! Incidentally, sharp-eyed movie watchers will have noticed that the young actress who portrayed Vasquez was the same one who played John Conner's adoptive mother in John Cameron's "Terminator 2". She was also the lower-class mother in his "Titanic" who lulled her children to sleep as the icy water rose around their bed, the little scene that brought every parent in the theater to tears! There's a fair number of small air bubbles in the resin, and some of the metal parts are a bit rough. You see in pic#4 that the gun barrel cradle is cast solid. I will be rebuilding this and a few of the other gun parts. There's a big air bubble under the right foot that took away the front of the boot. Overall, the moldings are acceptable, I was hoping for a bit better for $120.00 USD, though. There's more work than I had expected for a kit of this price, but I'm not disappointed and would recommend it. I'm glad that I won't have to sculpt Vasquez myself. Many thanks to Alfred's better half for providing the review sample. Manufacturers and retailers, interested in getting your wares reviewed and publicized on a site averaging 3000+ readers a day? Contact us! This page copyright © 2002 Starship Modeler. Last updated on 1 February 2002.